If you would like to help your dog or puppy become a happy, healthy and social companion, then one-on-one training with Dog Security may be perfect for you. We offer dog training in Ipswich, Brisbane and the surrounding areas, so people can benefit from world-class training for them and their pet. Our trainers can work with you and your pet through a range of training stages, all the way from puppy to dog. We can take you through the initial stages of training, through to advanced training for adult dogs. If you live in Brisbane, Ipswich or the surrounding areas and you would like to train your dog to be a healthy and happy social dog – Dog Security can help. In addition to general puppy and dog training we offer training on suspicion and home security for dogs. If you are looking to hone your dogs ‘guard dog’ skills while keeping them a happy and friendly family pet we can help. 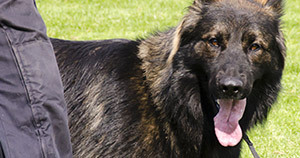 Dog security has partnered with MSK Online Training to offer a range of online training videos. These online training videos are suitable for both puppies and adult dogs. Click here for more information. If you would like to learn more about dog training please contact Dog Security today.